Figure 11 is credited to Bill Breed and Bob Scarborough. Figure 12 is credited to Peter Coney and Bob Scarborough. Figures 11 and 12 show the Paleozoic layers seen at the Grand Canyon and SW Utah. Paleozoic deposits extended south into Mexican territory, but the southern shoreline and continental edge ran through north of Hermosillo. Northern Sonora and Arizona looked like present-day Bahamas offshore of Florida. Continental rocks of Mexico will only be formed later, brought together as so many slices taken off of adjacent coasts after Paleozoic time. The end of the Paleozoic period, some 250 m.y. ago was marked by two tremendous events, the first being the breakup of the Pangea supercontinent that existed only briefly (Figure 5). But this was accompanied by a very tough time for life. Over a short time a major mass extinction occurred called the 'end-Permian' extinction. In the seas about 95% of all species died off, and on land, some 80-90%. We have tried to find the cause, without success. Evidences seem to be lacking. A big event happened - the production of the largest-ever basalt volcanic field on land of all time called the 'Siberian traps' (trap is a British word meaning basalt flows). There is no geological reason for its existence - so was it due to a mega-meteorite or asteroid impact? There is no meteor dust found anywhere at this time. Did the Pangea breakup destroy lots of coastal habitats? But why did that affect all the land creatures? A major mystery. Paleozoic deposits have been eroded away basically west of Tucson and throughout southern California during more recent uplift of the land and protracted erosion. Figure 30 (geologic map) shows how scattered Paleozoic outcrops are in SE Arizona. There are tiny Paleozoic remnants found near Bouse and Quartzite. The entire Paleozoic section can be seen in the eastern escarpment of the Whetstone Mountains as you stand at Kartchner Caverns State Park parking lot. The layers are present in the Santa Catalina Mts of Tucson (visible from San Pedro vista) and many areas northward. Driving north on Highway 87 just north of Strawberry (heading towards Winslow) you get the best possible view of the Mogollon Rim, the southern edge of the Colorado Plateau, a major south-facing cliff that exposes most of the Paleozoic section, while headed north from Strawberry and towards Winslow, the best view of the cliffs near the turnoff towards Tonto Natural Bridge State Park. The big cliff goes for miles in both directions. A thick white unit in the roadcuts near the top of the cliff top is the Coconino Sandstone, an ancient coastal sand dune complex. This same unit is the prominent white band just below the top layers at the Grand Canyon. In Permian time (last period of the Paleozoic) there is good evidence for the first appearance of differing kinds of reptiles - their ancestors, the amphibians around for considerably longer. One kind of reptile called Lystrosaurus, which looked like a reptilian bulldog complete with fangs (likely an omnivore), would survive the mass extinction at the end of Permian time, and become the unlikely evolutionary mother of all dinosaurs. South of the Mogollon Rim, (southern edge of the Colorado Plateau), lots of river erosion has removed the Paleozoic strata in some places but not others. I-17 going north out of the Verde Valley rises along a gentle ramp of lavas that bury and conceal the Paleozoic strata and the Mogollon Rim. So along the Figure 11 cross-section there is not a single cliff to mark the edge of the Colorado Plateau. In the figure note that at the Grand Canyon (left side), the canyon has cut through three different rock series - the flat-lying Paleozoic section; a lower series of tilted strata which are the Grand Canyon Series, mentioned above and called the Apache Group in central Arizona; and the basement rocks of the region, ancient granites and schists - here called the Vishnu Schist (Figure 49). Rafters down the canyon get a good view of all this. This schist is the highly pressure-cooked result of the island collisions that glued the southern islands to old North America, some 1,750 m.y. ago - the schist was made from the pressure-cooking of muds and sands that collected on the shores of the islands, depicted in Figure 6. Figure 12 is a continuation of this same cross-section north and west into SW Utah, the Grand Canyon sitting near the right edge. 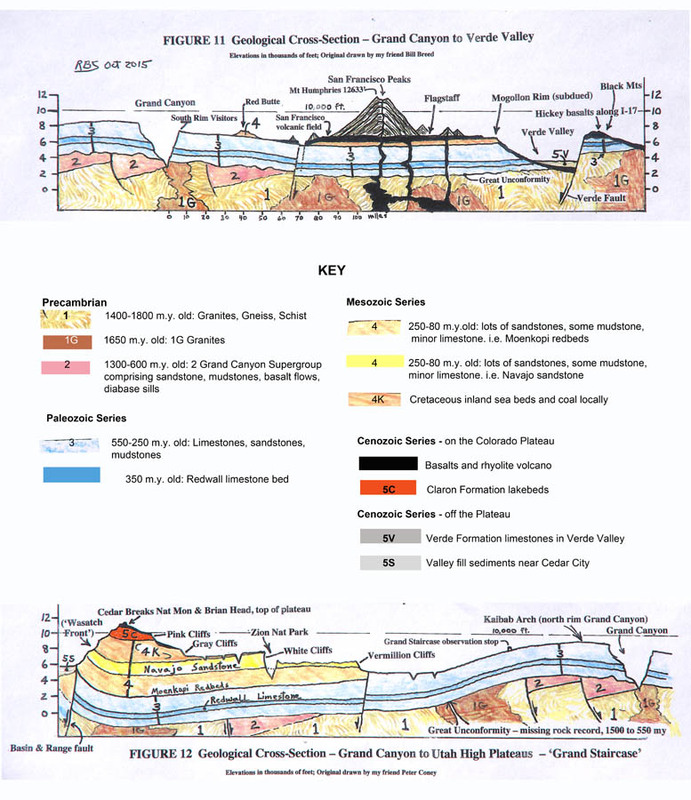 This cross-section runs through the SW corner of the Colorado Plateau. You MUST visit this region and view what is called the 'Grand Staircase,' a world-class example of stratified rock layers, famous enough that geologists from everywhere come here to see the place. The staircase for giants starts at the bottom of the Grand Canyon in the Vishnu Schist (Figure 49). (An easier visit begins at Desert View in the park where you view the schists in the narrow gorge at the bottom.) From there a giant may step up through a series of stairsteps, up through a few benches cut upon various Paleozoic layers, and then, crossing into Utah, step up onto the Vermillion cliffs (Jurassic strata) (Figure 60), the White cliffs (still Jurassic, exposed at Zion National Park) (Figure 59), the Gray cliffs (Cretaceous seabeds), the Pink cliffs (Eocene lakebeds), then some fossil sand dunes, and finally arrive at a high point of the Colorado Plateau at Cedar Breaks National Monument above Cedar City Utah, sitting at 10,000 feet above sea level as you stand upon the last colorful lakebeds called the Claron Formation (Figure 48). The top of this high plateau, covered with lakebeds--is there a problem here? (These same lakebeds are seen by the hoards at Bryce Canyon National Park to the east.) Nearby you can drive further up onto a isolated lava peak called Brian Head, at 11,400 ft. In marching this path from Grand Canyon to Brian Head you will have ascended through a ~16,000-foot thickness of stratified rocks - a truly grand staircase, and all the steps shown in Figure 12. At Cedar Breaks viewpoint, you stand on the very extreme tippy western edge of one of the 'high plateaus' of SW Utah, part of the Colorado Plateau, where you peer westward into the amazing Basin & Range province. On a windblown ridge just below the main Cedar Breaks viewpoint is a remnant population of bristlecone pine trees, easy to see, some individuals about 2000 +/- years old here. They are also seen at Bryce Canyon along a nature walk, at the far end of the visitor road. In the White Mts of westernmost Nevada (east of Big Pine town, California) there are individual bristlecone pines that are 4,600 years old in the Methuselah grove. The oldest known tree along a trail is, of course, unmarked*. Another striking place to see bristlecone pines is a loop trail at the end of the road at Great Basin National Park Nevada. Often the road is icy even in July. This trip up the Grand Staircase is my favorite more local geology fieldtrip for groups. *One may wonder about the oldest known individual tree or plant in the world. There is no straightforward answer, considering that some plants produce colonies of clones from a 'mother,' like creosote bushes and aspen trees. Along the lower Colorado River there are 'fairy rings' of creosote bushes that all grew from a mother plant at the center whose fossil roots radiocarbon-date to14,000 years old. Similar tests on mother roots of an aspen grove at Fish Lake Utah produce a mother age of 80,000 years. In Sweden there are dwarf spruce trees, still growing strong, dated at 9,550 years of age - a world record age? See Rachel Sussman's project, 'Oldest living Things in the World,' referenced in Yes! magazine, Winter 2013, p. 28.